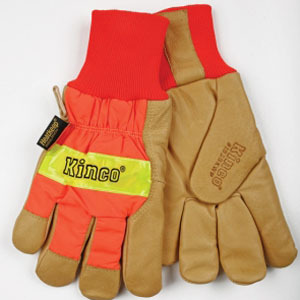 SAFETY ITEM > Work Gloves > Lined Grain Pigskin Glove w/ Waterproof Insert, Knit Wrist, Safety Orange. Waterproof Lined Grain Pigskin Work Glove. Features AquaNOT Waterproof Insert, Heatkeep Thermal Lining, 3M Scotchlite Reflective Material, Safety Orange Nylon Back, and Knit Wrist. Three Layers Protect Against Cold and Wet to Keep Hands Warm and Dry.